Outside Heritage Mall in Albany on the afternoon of Dec. 13. 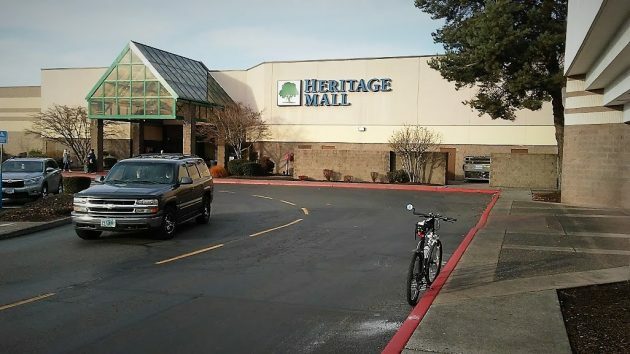 The owners of Heritage Mall have asked the city of Albany to approve their plan to subdivide the acreage and break the mall property into five separate lots. Their application doesn’t give a reason. But according to published reports, mall owners around the country are responding to the loss of big anchors by turning the voids into spaces that attract people for something other than shopping, such as restaurants, fitness centers, or various entertainment venues. One source I talked to said finding a new use for the former Sears store at the mall would probably be easier if it was its own tax lot separate from the mall, which the proposed division would accomplish. Since March, the main part of Heritage Mall of about 22 acres has been owned by Namdar Realty Group of Great Neck, N.Y. The subdivision application lists the owners as Igal Namdar, Matin Hakimi, and Elliott Nassim, all of Great Neck. In June, the Reuters news agency reported the Namdar group specialized in buying up struggling malls. At the time it owned more than 100 malls and retail centers across the country. According to Linn County records, the group acquired the Albany mall on March 30 for $11,933,729. The property is assessed for tax purposes at $12.1 million. This year the owners paid $213,819 in property taxes. The Albany Community Development Department published a notice of the Heritage Mall application on Nov. 26. Approving the tentative subdivision plat is up to the department’s director. No public hearings are involved. Having a restaurant or another thriving business in the former Sears slot is better than a big blank space. It It is not an empty space, it is now a kids play place. With lots of bounce houses. My grands love it. I would like to hear the reasoning behind the “not ideal” comment. Martineau’s assessment sounds conspiratorial. Is there bias in the City’s bureaucratic underpinnings. Perhaps a part of it will be Cannabis friendly. Rhea, I hope you were kidding when you wrote that it would perhaps be “cannabis friendly”. I for one would not darken the door of the mall if that were to happen. Fouling the indoor area where children play is not a grand idea.